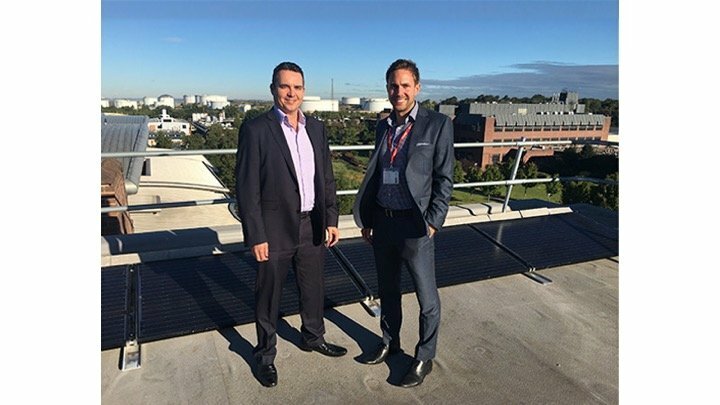 The University of Chester’s Energy Centre is continuing its mission to develop renewable energies, with the installation of a solar PV unit on the Centre’s roof. The newly installed PV panels have been donated by Energy Gain UK. The solar energy equipment supplier recently completed a 4kW south facing Solar Edge panel installation. It is now fully optimised and will form part of the Energy Centre’s ongoing research into solar energy technologies, connecting to the Energy Centre’s pioneering microgrid. The Energy Centre at Thornton Science Park provides a flexible place where industry and academia come together to innovate, develop and demonstrate new energy technologies connecting to a microgrid with 1,000m2 indoor and external test areas available. All are connected to advanced ABB supervisory control. The aim of the Centre is to promote growth and acceleration in the development and exploitation of new technologies for the energy market and it is available for use by SMEs to connect to as tenants on a short or long term basis. The test zone is extremely versatile, allowing tenants to work in and connect to an individual bay; through to full use of all the microgrid equipment listed above.